American DJ introduced 4 new club/DJ/band effects that feature its exclusive new Tri-Color LED Technology. This breakthrough makes it possible for LED effects to create beams in a rainbow of different colors (not just the typical red, green and blue). Here’s how Tri-Color LED Technology works: Each lamp is actually a 3-in-1 lamp, containing 3 different color 1-watt LEDs – one red, one green and one blue. With these advanced tri-color LEDs, RGB color mixing can be done within each lamp, allowing individual beams to be created in whole spectrum of colors, unlike traditional LED effects with single-color lamps that can produce only one-color beams. Tri-Color LED Technology offers other advantages, too, like more vibrant, even-toned mixed colors, and the elimination of the annoying multi-color shadows that commonly appear on objects and surfaces illuminated by single-color LED RGB fixtures. 1) Tri Pearl LED – An extremely compact and lightweight DMX-compatible LED moonflower, the Tri Pearl LED is great for mobile DJs and small venues. It is powered by a single 3W Tri-Color LED -- comprised of 1W red, 1W green and 1W blue LEDs – and is capable of producing color-changing beams in 7 colors: purple, yellow, cyan, red, green, blue and white. Three DMX channels give users control over Dimmer/Strobe, Color and Rotation. 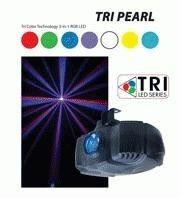 The Tri Pearl LED can also be operated without a controller as a sound-active effect running to built-in programs. Its long-life LED lamp is rated at 50,000 hours. It features a high-tech lightweight plastic case design, measures 9” x 11.75” x 8” and weighs only 3 lbs. 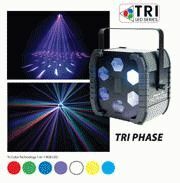 2) Tri Phase – A unique-looking LED moonflower effect, the Tri Phase has five hexagonal-shaped lenses that produce 57 beams of LED light in 7 colors: purple, yellow, cyan, red, green, blue and white. With a 65° beam angle, it gives great coverage over a large dance floor or wall. Featuring 1.8 degree long- life stepper motor technology, it can produce quick accurate movements or smooth, fluid moves for mood music. Four DMX channels give control over Color, Rotation, Strobe and Dimmer. It can also be operated in sound-active mode. Although comparable to a 250W halogen effect in output, it draws only 12.5W of power and has a lamp life of 50,000 hours. It measures 7.25” x 12” ‘x 13.25” and weighs 8 lbs. 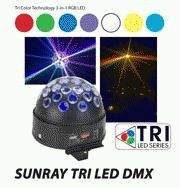 3) Sunray Tri LED DMX -- A rotating spherical effect, the Sunray Tri LED DMX shoots beams around a room like a mirrorball, but it’s powered by a cutting-edge Tri-ColorLED instead of the traditional halogen lamp. It produces 34 crisp beams from one 3W Tri-Color LED source in 7 colors: purple, yellow, cyan, red, green, blue and white. With a 138° beam angle, it makes a great centerpiece effect, with or without fog. Can be operated in sound-active mode or via DMX with 3 channels for controlling Dimmer/Strobe, Rotation (clockwise/counter- clockwise and speed), and Color. Also linkable in multiples via XLR cable. Draws only 13W of power and features 50,000-hour long-life lamp operation. Compact and lightweight, it’s great for mobile use, measuring 8.25” x 8.25” x 7” and weighing only 4 lbs. 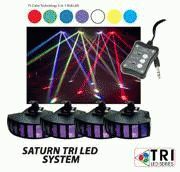 4) Saturn Tri LED System – A complete light show in a box, the Saturn Tri LED system includes: 4 x Saturn Tri LED fixtures, a universal UC-3 controller, and 3 x 3-pin XLR linking cables. It’s an ideal easy-to-use, all-in-one system for smaller clubs and venues. Each Saturn Tri LED unit has 6 lenses that produce 8 brilliantly sharp beams. Each unit is powered by one 3W Tri-Color LED source that can create beams in 7 colors: purple, yellow, cyan, red, green, blue and white. Includes fast-to-slow strobe and 0-100% electronic dimming. Features 4 DMX channels for controlling: Red, Green, Blue and Strobe/Dimmer. Can also be operated in Master-Slave or Sound Active Modes, or with easy-to-use UC-3 controller. Long-life LEDs are rated at 50,000 hours. Each unit has a power draw of just 7W, measures 8.75” x 12” x 5” and weighs 4 lbs. 5) Galaxian – Combining a 30mW green laser and an 80mW red laser, the Galaxian produces an awesome shower of more than 500 red and green laser beams that create a solar system type effect when projected on a ceiling or wall. At a 90° beam angle, its massive beam spread can cover a large area with its exciting built-in laser patterns. It includes 4 DMX channels for controlling: Red Laser, Green Laser, Rotation and Macros. Can also be operated in Master-Slave and Sound Active Modes, or with optional UC-3 remote control (sold separately). Features random slow-to-fast strobe, and Digital Display for easy menu navigation. Uses 1.8 degree stepper motor for smooth microstepping. Extremely energy efficient, it consumes only 12W of power. Great for mobile use, it measures 10” x 9.75” x 3” and weighs 6.1 lbs.